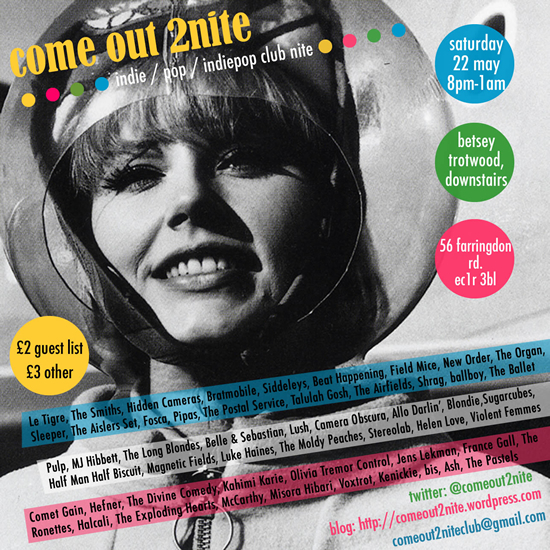 Come Out 2Nite is a sporadically-held indiepop / pop / indie club night currently residing in the lovely basement of Farringdon’s Betsey Trotwood, legendary home of many past and present indiepop events, clubs and gigs. The wandering ghost of a Victorian orphan girl who is well into Hefner and Belle & Sebastian is said to haunt the building. Our modus operandi goes something like this: we pick three themes out of a bingo drum and have to stick to them in the first part of the night; themes could be anything from Music From Canada to Songs Goths Secretly Love. We’ve got huge music collections and we know how to use them, but when it comes to theme sets, we welcome all suggestions– provided you give us plenty of time before the night to find the songs in question! The second part of the night is a free-for-all designed to get you dancing. The three of us have diverse tastes that fall within three very loose and floppy genres of music: indie, pop, and indiepop. There is much shoehorning. Our next night isn’t until September 2010. We’re not sure if we’re going to have a guest DJ yet, but hopefully there’ll be another fanzine for you to buy. This means I have to get around to writing it, rather than just saying I’m writing it. The other exciting news is that we’re DJing this year’s Indietracks festival – we’ll be in the tent on the Friday night. So do come and DANCE DANCE DANCE DANCE (in your Joy Division Oven Gloves). Do check our blog for more news, gossip, setlists, photos and blatherings. And if you want to learn a little bit more about Come Out 2Nite’s crack* team of DJs, click here. We hope to see you on the dancefloor soon!